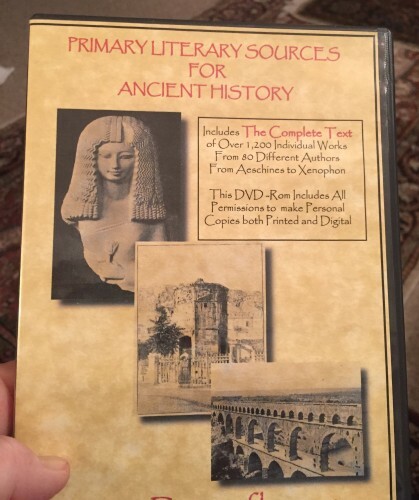 Primary Literary Sources for Ancient History DVD contains the complete texts of over 1,200 individual works from 98 different authors — from Aeschines to Xenophon – Greek, Roman, Egyptian, and Babylonian. It is like having an entire library of classical literature, except that you have it on a DVD instead of having actual hard copies of the books. We have only one copy left. This DVD was produced to go along with our book Ancient History from Primary Sources: A Literary Timeline, which is on sale this week for $16. This entry was posted on Tuesday, February 12th, 2019 at 10:58 pm	and is filed under Trivium Pursuit Sale. You can follow any responses to this entry through the RSS 2.0 feed. Both comments and pings are currently closed.